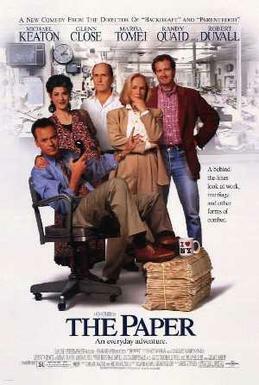 My review of “The Paper” directed by Ron Howard and staring Batman. I once watched this movie two times in a row. I can’t remember the occasion, specifically: maybe I was sick. I don’t think it was because it was so good that, upon finishing it the first time I had to rewind it and watch it again imediately. Probably I wandered off and then cam back and pressed play and it just started again and I didn’t bother shutting it off. I may have been sickly, as I mentioned. I watched it again yesterday, which is why I bring it up.